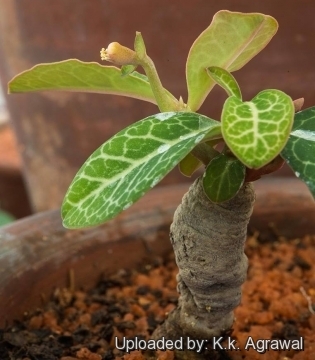 Origin and Habitat: Euphorbia pseudoracemosa is endemic to Tanzania and Zambia (Central Africa). Type locaty: Tanzania, Ufipa District, Kipili. Altitude range: 770-1650 metres above sea level. 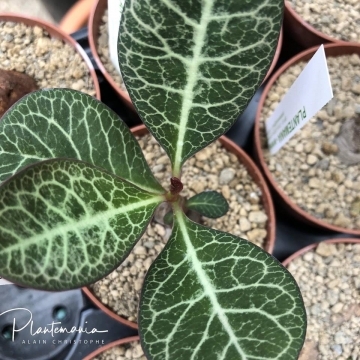 Description: Euphorbia pseudoracemosa, much better known under its old name Monadenium pseudoracemosum, is a glabrous succulent geophytic perennial herb, with a cylindrical tuberous root, also called a caudex producing a woody subterranean stem to 6 cm long; annual stems to 7 cm tall topped with interesting olive green leaves with pearly white veins and red underside. Seed subglobose black speckled. Two varieties are recognized, the nominate form and subs. 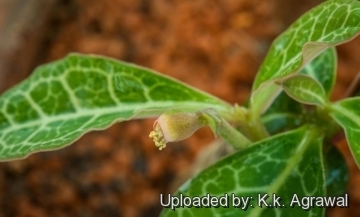 lorifolia. 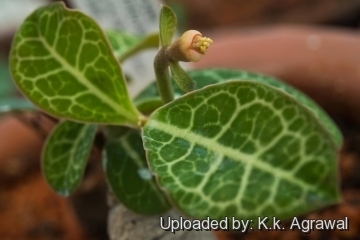 It is close to Euphorbia fwambensis. Derivation of specific name: Latin epithet meaning pseudo = like, racemosa = in racemes (clustered). 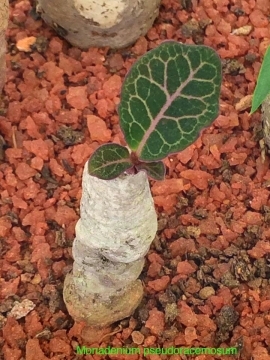 Caudex (rootstock): Root tapering to 10 cm long by 1,5 cm in diameter merging with a an underground woody stem of 6 cm long. 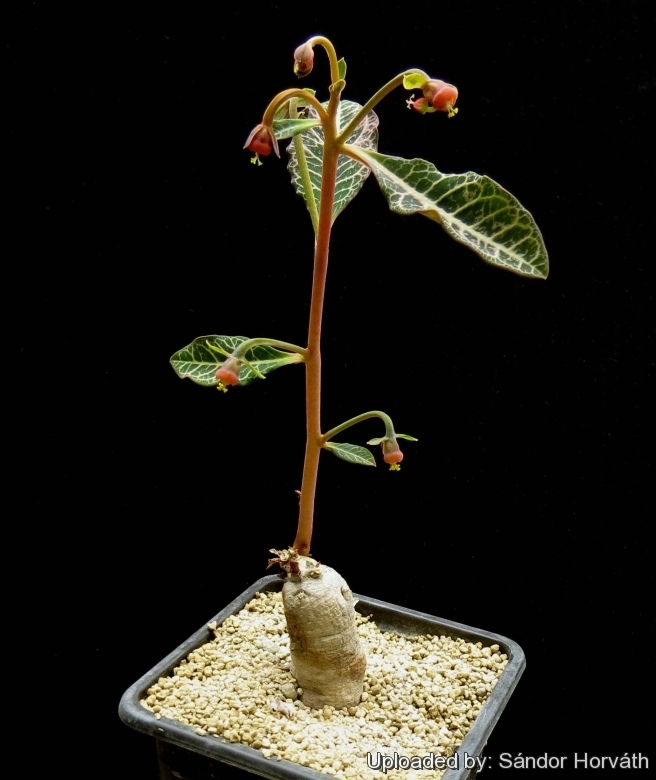 Annual stems; Solitary or few, erect, simple, cylindrical c. 7 cm tall, simple or (rarely) branched only at the base. 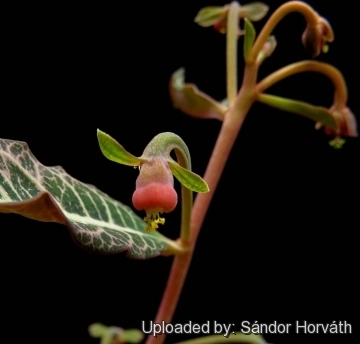 Leaves:* Subsessile obovate (in Tanzania) to 7.5 long, 6 cm wide (or oblanceolate to 11 cm long and 2 cm wide in Zambia), apex rounded, margin entire or crisped, olive green with pearly white veins, midrib keeled beneath, lamina often tinged red on the undersurface. Stipules glandular very small. 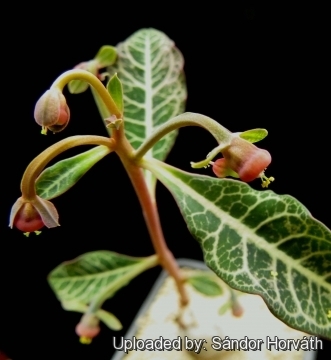 Euphorbia pseudoracemosa (P.R.O.Bally) Bruyns: (var. pseudoracemosa) has obovate leaves to 7.5 × 6 cm and margins entire. Distribution: southeast Tanzania near the shores of Lake Tanganyika.